Researching our past for answers to the future. Insightful resources delving into the realms of alternative, fringe sciences, and mysterious happenings of our ancient ancestors. Explore many unexplained curiosities of mankind's past in relation to modern life while learning how distant relatives have impacted the world we know today. The concept of a MysteryPile derives from a multiple-fold origination. Firstly, referring to unknown wonders of the world researchers are spending time to understand and explain, combined with a duality. In the Pile, rests a tangible amount on one side, with the other represented by massive pillars found supporting superstructures at megalithic sites around the world. 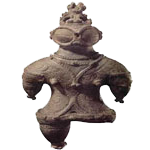 Ancient Aliens Artifacts and relics resembling aliens and astronauts. Spirituality Perspectives on life, existence, and understanding consciousness. Locations Mysterious megalithic locations found around the world. Mystics Explore unexplained realms of science and mysticism. Paranormal Apparition phenomena of spirits and entities from other dimensions. Space & Time Discoveries unraveling mysteries of the cosmos, space and time. Cryptozoology Unexplained creatures and cryptids found around the world. Nature Mysterious phenomena found in the natural environment of planet Earth. Our curated collection of ancient mysteries includes several educational articles, thoroughly researched and written in an unbiased manner to help further scientific exploration into this subject matter. The goal of an ancient mysteries researcher is to provide tangible evidence and thought provoking questions to inspire research through a culmination of multiple scientific and religious fields. Videos for each topic are provided as an alternative perspective and for further reference on respective subjects thanks to the generous resource library on Youtube. As researchers, we embrace professional opinions, sourced knowledge, and an ambition to help everyone discover the truth of our past. Articles presented in the spirituality sections are written based on an overwhelming or unanimous belief that said artifacts do exist, somewhere in the world. Exact details on a scientific level remain mostly unknown or enshrouded in secrecy. Scientific or religious subjects do face scrutiny on a regular basis and a definitive interpretation is usually placed on reader trust. We understand fringe topics in alternative sciences are controversial, and in these realizations, a cautiously optimistic approach is necessary and recommended. Parental guidance is suggested for visitors under 13, and all controversial articles are clearly marked with a † indicator.